Abstract Painting: "Pascha, The Eighth Day"
Pascha, which is to say the date of the ressurection, is traditionally considered to be the start of the eighth day of Creation. It's also the eighth day in my Holy Week series, so the title is a dual pun referring to that fact as well. The flame? 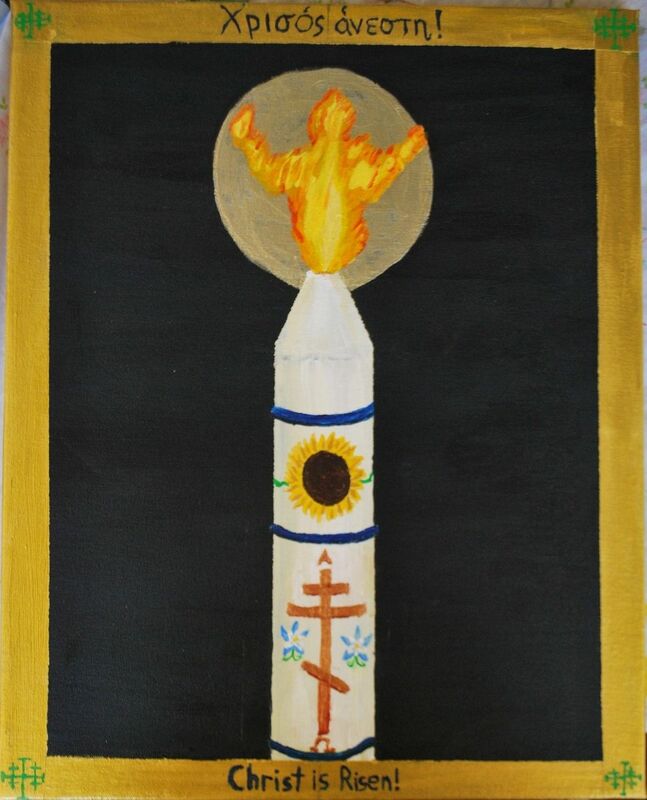 Well, in the service for the Resurrection, all lights in the church are extinguished, save for one: a light on the altar. From this light, the priest lights a candle, which then is used to light all the other candles in the church. I've always felt that the Eschaton will come on a Pascha; the priest will go into the altar, to get the light, but instead, out will come Christ, and it will be Pascha forever. The flame, therefore, represents the risen Christ. Furthermore, I've always thought that the Eschaton, the ending of all things, will happen on a Pascha. The priest will go into the sanctuary to get the light, and instead, Christ, who is the light, will come out, and it will be Pascha for all eternity.